How do mom's do it? Well, we know of one way, and that's where the Mother's Little Helper Pill Box comes in. This attractive, fine chrome pill box is just what Mom needs to organize those little magic wonders that, as the Rolling Stones put it, "helps her on her way, gets her through her busy day." 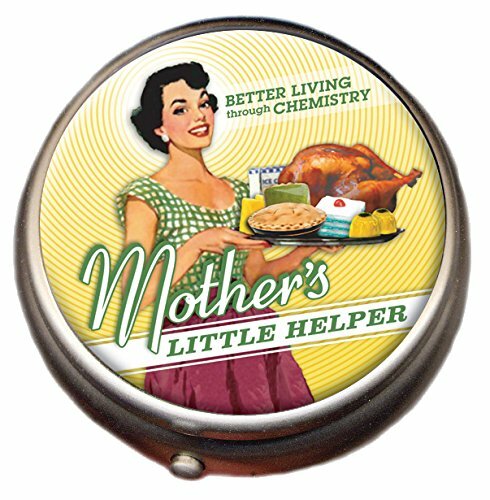 The Mother's Little Helper Pill Box would make a funny and useful gift for any overworked, stressed out, and under-appreciated mom (which is just about all of them). The container is 2" in diameter (across), and 5/8" thick. It fits perfectly in your pocket, or in a purse. If you have any questions about this product by The Unemployed Philosophers Guild, contact us by completing and submitting the form below. If you are looking for a specif part number, please include it with your message.